Here begins a new series of recent images in the 16:9 wide screen ratio, posted for free download as background wallpaper on your monitor. (A right-hand click of your mouse over any image will show this option). Most of the work I have yet to show for this must be cropped from 24 x 36 frames, but those to come from my Lumix LX3 are taken in 16:9 ratio. Downloads are for personal use only. Two lagoons soften the urban impact of Waikanae, a retirement community spread out across the sand country of the Kapiti coast. 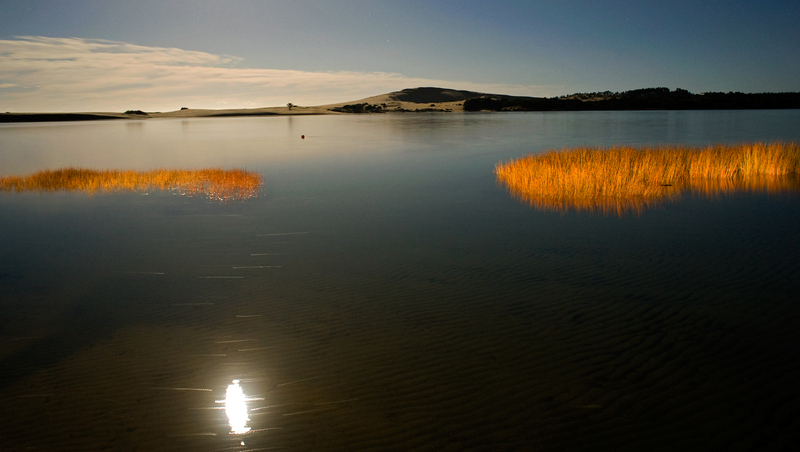 The estuary is notable for its bird life, and 60 bird species breed there. 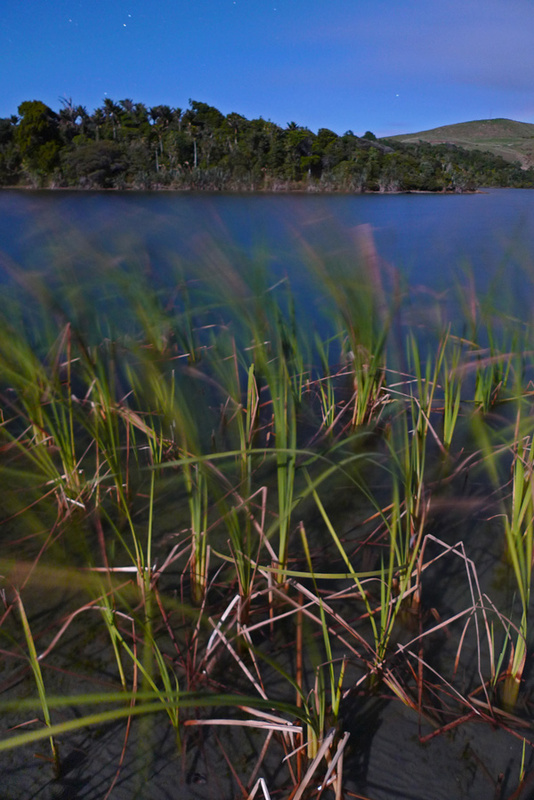 The pampas grass above fringes the freshwater Waimeha Lagoon, a wildlife refuge well screened from surrounding suburbia. 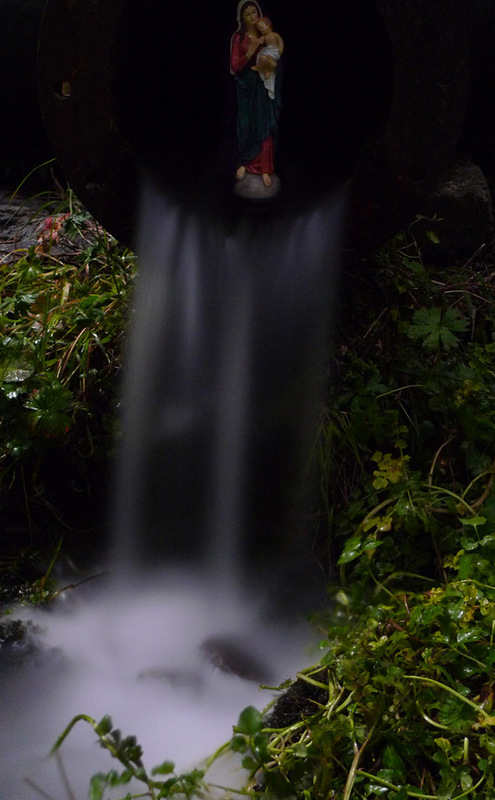 Even at night there was a hubbub of bird calls from the waters. Presumably the pampas grass has been part of the lakeside planting, although the vigour of its clumpy growth gives it weed status elsewhere. Here it provides colour and contrast against a starry background. I was interested in the movement of the blooms, but with the telephoto’s shallow depth of focus I had to compromise between a smaller aperture and the cloud likely losing too much shape in the longer exposure required. I couldn’t expect the cloud to hold still while I decided on the best setting. As with my earlier Lumix LX3, I’ve only used the M (manual) setting on the Nikon D700. While you need less decision on auto settings, you also give up considerable creative control. To me the key thing with auto is that it’s harder to work out which variable is causing you problems – and for sure, moonlight photography is all about variables. And problems. This shot combines moonlight and urban glow from far-off street lamps. 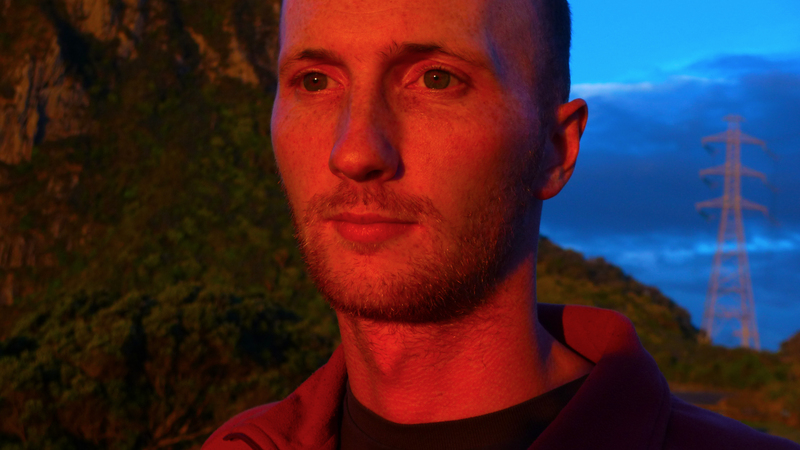 Using the tungsten (incandescent) setting made the shot too cool, so I kept to Direct sunlight for light balance. In post-pro much of the warmth has been retained; you can see it too in the cloud. Light pollution comes with the territory of course, but in a long exposure any low cloud shows the pervasiveness of this pollution, even in apparently remote locations. This was my recent surprise at Te Hapu, a cattle station in Golden Bay, where light from several street lamps well over the local horizon showed up in the cloud layer. This simple image depends for its impact on the white & blue contrast and the unexpected double cross. Also visible is the Southern Cross constellation, moving with the other stars in this 40 second exposure. Some uncommon fretwork and the conical pines serve as additional points of interest. The lens was set at f2.8, the maximum when the Lumix LX3 zoom is at the telephoto end – a modest 60mm in standard film terms. ISO was 100 and the frame has been slighly cropped to partly correct my poor levels with the tripod. The front of the church was too exposed to the highway headlights and nearby intersection lamps, but I was pleasantly surprised to find the venue redeemed for moonlight photography by going around the back. 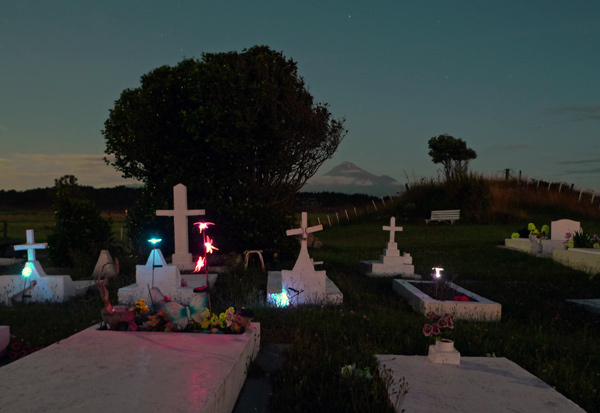 Complete with some 19th century graves, this seemed a tranquil spot and one in which I was unlikely to be disturbed by the living – both these aspects being highly valued by the night photographer. Working in the dark is quite absorbing but at the same time your creature instincts are sharpened in the experience, and it’s clear to me that our distant ancestors were not mammals of the night. As well as being an absorbing occupation, moonlight photography is at times particularly frustrating because the movements and adjustments easily made by daylight can become so muddled or mistaken in the half-light. I’ve used a caver’s light (headband fashion) but can’t repair my current one. Keeping up good habits helps to reduce a few hassles (“No, the lens cap always goes in your right pocket”; “Better zip that bag up right now”) but other irritations are likely as fatigue sets in after midnight. You can also blame fatigue the next day when you ruefully recognise an overlooked angle or missed opportunity from the night before. This photo would be improved, I think, with 10-minute star trails but 60 seconds is the maximum on the LX3, as the camera has no B function for extended exposures. In this autumn study from my own front yard the background blur is star movement over 60 seconds. The zoom on the Lumix LX3 was set at 60mm, in full frame terms, and the aperture at the max, f2.8. The combination of city glow and moonlight was only just enough for the sensor, as the ISO of 400 shows – it’s a marginal setting on the LX3. The frame has been cropped slightly, as a tight composition presents real difficulty when you adopt the shoot-blind strategy for lack of a functional viewfinder in such low light. This evening was a great one for test shots with 3200 ISO, the results being only useful for extrapolating longer exposures at lower ISOs. Close-ups and botanical studies are a good challenge for the night photographer, especially seasonal shots such as this. 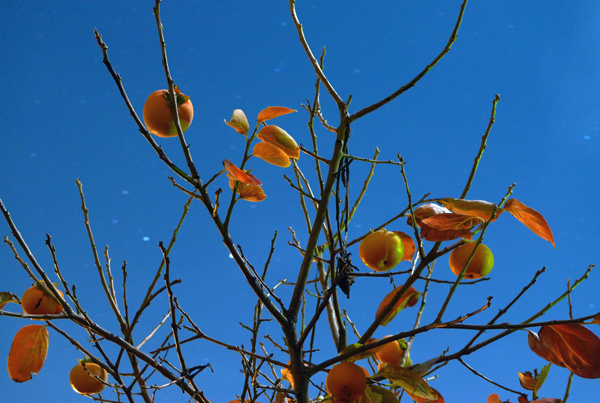 The persimmon tree loses its leaves very quickly each autumn, and your chosen specimen will be good for only one full moon of photography, or even less if a strong wind strips the tree while the moon’s still shining. The strong feature here is the simple two-colour statement, but the impact of the intense blue & orange really depends on your monitor, and its contrast and saturation settings. My own monitor has hopelessly unworkable adjustment buttons, and from this I conclude that many screens will be unable to show colour photographs at their best. Only with highly reflective scenes can the moonlight photographer stop down to f16, even with ISO 2000. While using 30 seconds, that is, the last speed on the Nikon D700 before B. The Lumix LX3 has one thing over the D700: an extra speed, 60 seconds. Of course you can do any length on the B setting, but you must time it yourself, which is less convenient. Admittedly there are worse hardships, but for me f16 is an aspirational aperture. I use it and B without hesitation in two situations. The first is for l-o-n-g exposures for star trails and the second is where I want the deepest possible focus. This especially applies to the shallow field of my regular partner, the 85mm lens (as above). By extending the field of sharpness over the greatest distance f16 usually covers careless or difficult focussing. If you have manual focus, work off the bracketed scale on the lens barrel: set the near bracket a little closer than your estimated distance to the foreground interest. Or try some pre-focus frames. Sometimes I do trials with f1.4 and a few seconds. The results are always awful but can be deleted as soon as you have the correct fix – and once you calculate what f16 will need (a 7-stop difference). Not every camera can manage ISO 2000 without excessive noise – electronic static comparable to emulsion grain, the old bane of fast film. A full-frame (FX) digital camera apparently handles this problem better than the sensors in DX cameras or compacts. The shot has squared up fairly well. We’re looking northeast to the Sugar Loaves at New Plymouth, from near the Oakura River. The receding wave leaves ghostly impressions of movement. The tripod was set up at the top of the tide but I still had to move around as rogue ripples came up. Here 60 seconds would have doubled the risk of a shaken tripod; the wasted frame would take 2 minutes to clear. Back Beach is a favourite destination for me – and it’s not too far from home. A pocket wild-place, the beach has many angles and facets, according to the weather, season and tide. As youngsters we would run down the long dune-face to the beach, and I recall my brother rescuing our young sister from a narrow ledge halfway down. Tracks back up along the cliffs were each lost to erosion in later years. This view was taken from the top of the beach. It was unpleasantly windswept that night but in this direction at least I could face away from the blast and shelter the camera and tripod. There’s a solitary star – where were the rest? 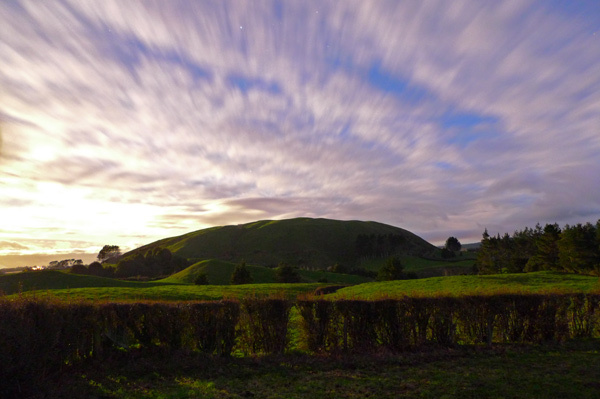 The clouds do not show any movement; they have arranged themselves to mimic the silhouettes of Moturoa (the original Sugar Loaf) and the left foot of Paritutu rock, an outcrop of local prominence. Of course there’s no detail in these volcanic remnants, as exposing for the landscape would simply have washed out the interesting contrast of the lights. At f2.8 for just 13 seconds, at a low ISO 100, the exposure was fast by my usual standard – especially as the moon was 4 nights from full. Moonlight photography well before full moon gives a higher moon earlier in the evening, enabling these sea-reflections on a western coast. The zoom on the LX3 was at maximum, “60mm”. I would liked to have got closer. The lights of the distant ship have not moved much in 13 seconds. The light trails also hint at the sea swell, but the foreground waters are in the lee of Round Rock, where the tide was an hour past high. 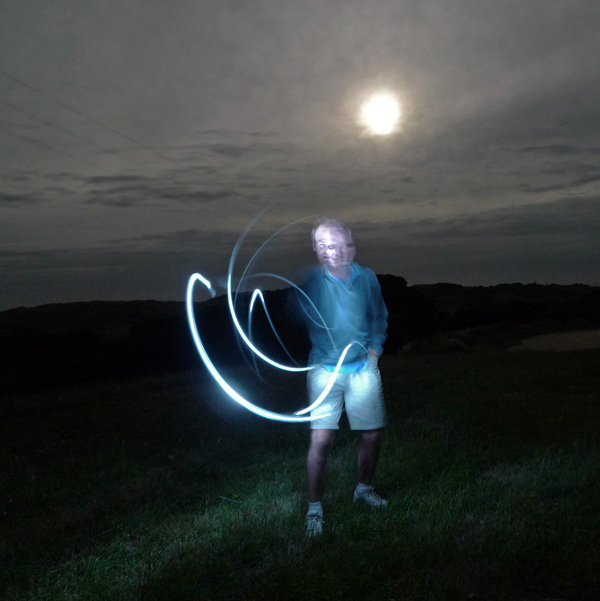 I am experimenting with surf and swell in moonlight photos of varying exposure length, and with different degrees of reflectance, but must confess I no longer keep a notebook for them. I have relied instead on EXIF data and last year’s tide tables for the details above. So begins another series of square frames… if they are not square on your monitor then believe me, I have counted every pixel. However these are not “as-composed” on the ground glass but knock-downs from the standard 24×36, each time from seeing a new way of interpreting an existing shot. Cutting away waste or just plain simplifying is a useful discipline! 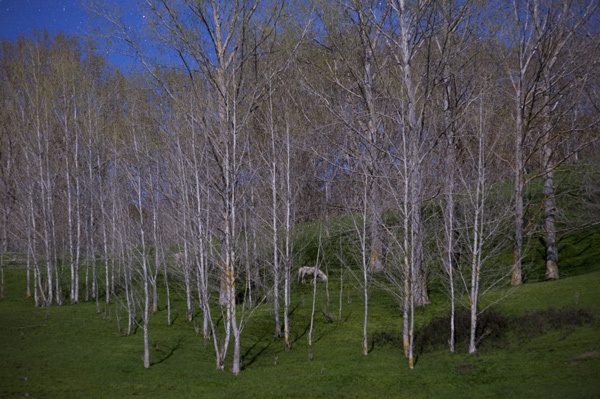 I was intrigued by the peer-through at this stand of pines at the Maude road end, north Taranaki. 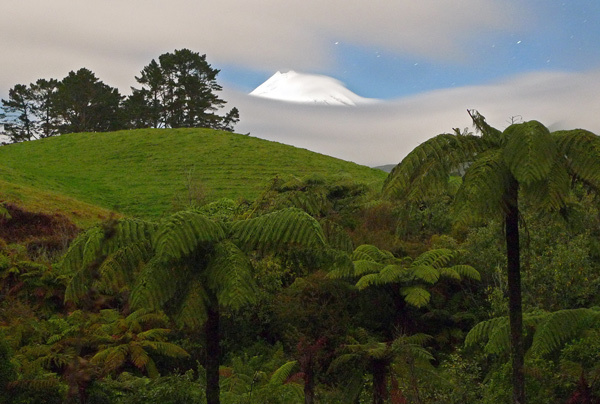 It had shadow and texture, and the slight shroud on Mt Taranaki was appealing. The square re-composition here is well-filled, and the bottom has a wee echo of the peak’s summit. 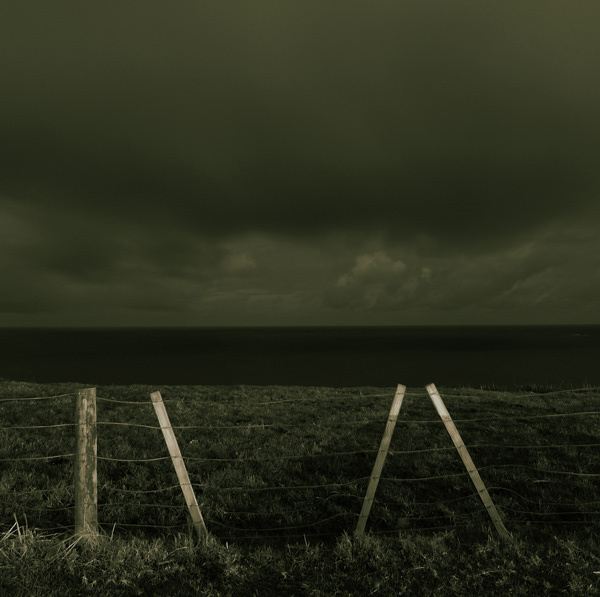 The diagonal bracing gives extra strength and a sense of depth is suggested by the foreground interest, tonal banding and retreating fence… while it has lots of texture, it could do with some movement, such as cattle in the background. Texture is the essence of monochrome photography, and so is side-lighting. The sepia or selenium tone was not obligatory but was more fitting than other combinations I tried under Colour Variations on Photoshop. I enjoy playing around with this feature but the palette is limited to blue, green and red. Settings were f2.8 for 60 seconds, ISO 200. The Lumix LX3 was on maximum zoom, an odd 60mm (in 35mm photo terms); the camera sacrifices its tele function for a fast f2 on the wide end. 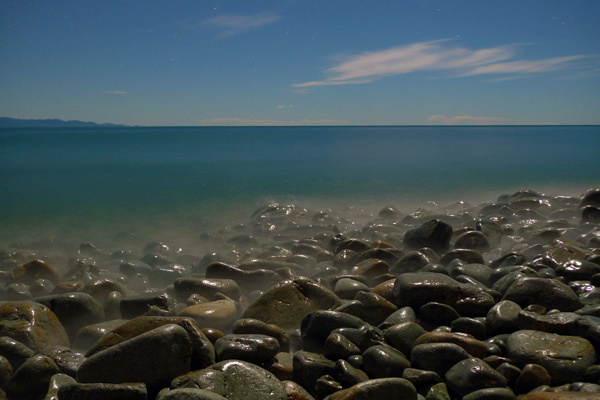 This trade-off has suited my love of moonlight photography, an extreme form of “available light”. Depth of focus is phenomenal, and owing to the laws of optics this depth would not be possible on a full-frame digital without a much smaller aperture – perhaps f8. These 3 extra stops however would extend shutter time and make more than tadpoles of the stars. Unfortunately the LX3 lacks a B function, so I’ll just have to try again sometime with the Nikon D700, in order to add star trails to this scene. For the night photographer, winter delivers an earlier start. There’s a better chance of a good stint as you are fresher creatively, and for longer. In July we antipodeans can take this sort of scene before dinner – it was already an hour after sunset, as the horizon fade suggests. The star might not even be Venus, but it was bright enough to be. Star smudges and trails near the edge of a lens are a good test of its sharpness, but this shot is compromised by extra noise from the ISO 400 setting. While not so high by today’s reckoning, on the Panasonic Lumix LX3 ISO 400 really is on the cusp, and lowering the contrast has partly camouflaged the electronic static inherent to this image. The other variables (60 secs@f2) establish that this moonless gloom is again at the Lumix’s limit. I abstained from tungsten, so the uncorrected light serves to underline the unexpected source – city glow, in the form of some far-off street lighting just below moonlight in strength. The zoom was set at widest, “24mm”, and the self-timer at longest – 10 seconds – to enable my quick trot down the bridge, to the casual pose I struck (with some effort). In picture-making a notable structure is similar to a giant specimen tree in that a figure always adds interest, by supplying the all-important scale. Compositionally, my figure is the third strike, or what I call “the Detail”. 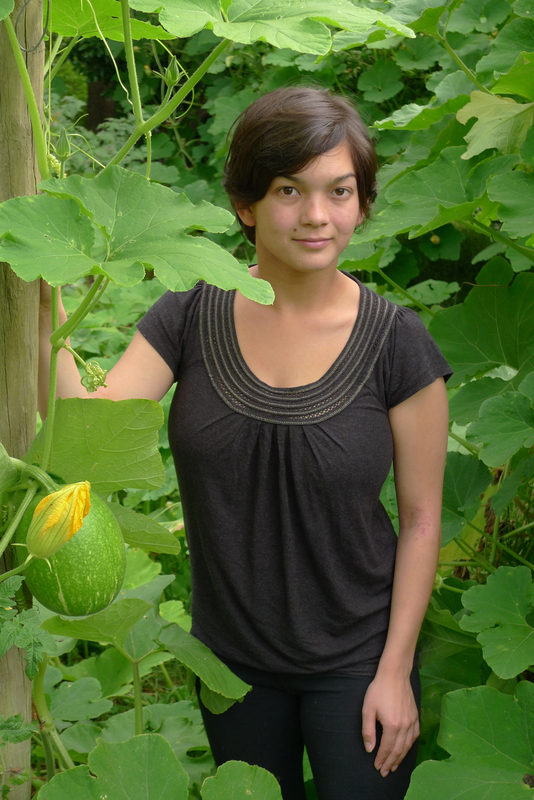 On the outskirts of New Plymouth, Te Rewa Rewa was acclaimed as a local icon as soon as it opened last year. The bridge links to a new section of the coastal walkway and is much used by cyclists. The minute exposure here ran the risk of someone running into the tripod, particularly when I was really some distance from it. Little traffic cones with glow lights would be useful as an extra safety precaution. There must be a world market for these – perhaps a dozen? 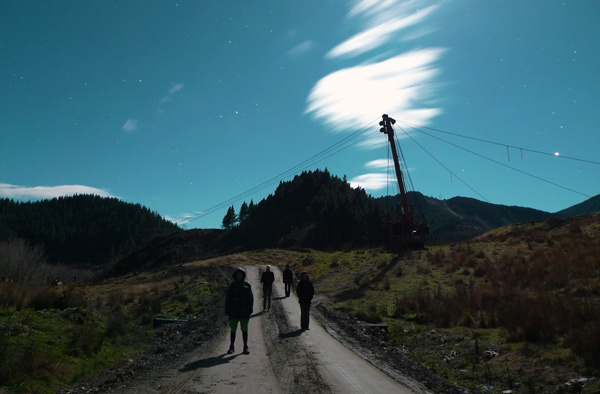 Moonlight photography that looks like daylight! Almost. Until I thought of adding the immediate foreground, this spot seemed unpromising for an interesting shot. 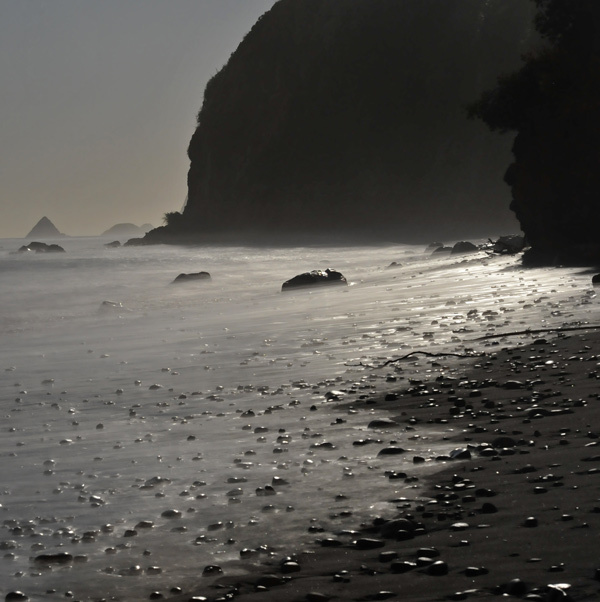 Although the high tide was surging below the crumbling cliffs of Back Beach, New Plymouth, the scene just seemed to lack depth. Using the wide angle end of the Lumix LX3 zoom (“30mm”), however, with some foreground for scale, gave a much better effect. Exposure was 60 secs/f2.2@ISO 400. I don’t recall why the higher ISO was needed but it was justified, and a further small boost was given in post-pro to get this night-for-day look. The photo received enough acclamation for inclusion in my Moonlight Calendar 2011 (October), and we have also published it as a greeting card. The movement of the flax and foliage shows that a steady wind was blowing (fairly common here); actually I was sheltering from the cliff updraught, and screened the tripod as far as possible from the buffeting. 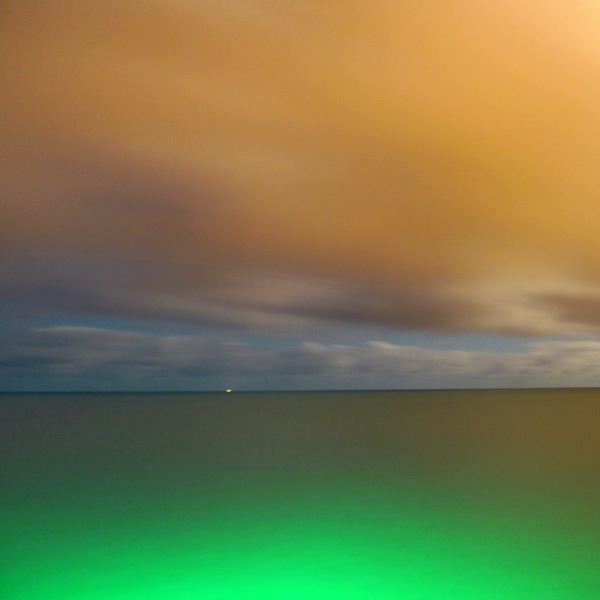 There’s a subtle cloud movement recorded by the long exposure but better still, the sea has been softened and turned an unexpected turquoise. Strangely, there’s no surf line around Snapper Rock but a nice highlight instead on the rocks at one end. You can walk dryshod to this island on very low tides. 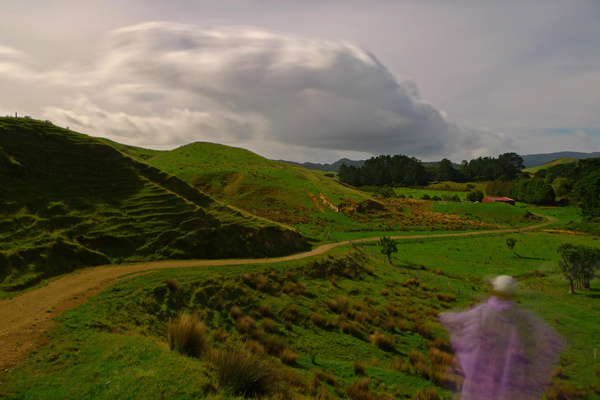 There are well defined kumara pits on top from old Maori times and great views are to be had from the spur at other end. In composition terms I gather that the appeal lies in its simplicity, sense of depth and movement, and its colour contrast. From the cliffs there aren’t that many options for a good frame on the islands (the Sugar Loaves), but this limitation is compensated for by the easy access and frequent changes in the weather, and so, of course, the light. This is the December image from my large format Moonlight calendar 2010. On this night a steady southwest wind was blowing across the lake – as often – at the Kaihoka Lakes Scenic Reserve. The reserve partly encloses lovely twin dune lakes in their original bushy settings, in the top left hand corner of Golden Bay, Nelson. With some Wellington friends we stayed nearby, but the evening above I had the place to myself, as the others somehow preferred the warmth and comfort of the farmhouse. 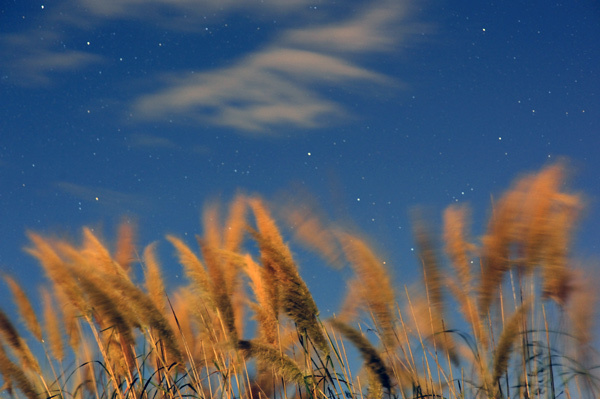 Wandering along the sandy shore by a waxing moon, I saw the rustling of the reeds as a likely subject, to continue my theme of movement recorded in a time-lapse sense. In this 60 second exposure (at f2, widest zoom, ISO 200) their fronds and tassles are blurred, while their motionless watery footholds are not. The side-lit reeds and the long shadows suggest the moon was still low in the sky at 10.30pm. The depth of focus wide open at f2 is remarkable, given how close my tripod was to the reeds at the bottom of the frame. Wanting a sense of depth and distance, I chose a vertical composition, looking over the reeds as well as through them. Stars shine but unfortunately the cloud was content with a peek-aboo role. This is not the main body of the lake, incidentally, just a corner of it. For calendar publishing this type of image has three risks: 1. while it definitely sings for arty sorts, it moves lesser mortals… less. 2. it works better in a certain gloom, but since everything depends technically on how it inks (or shows on your screen) the chances are strong that it will appear too dark altogether… here for safety’s sake I have added a small boost in post-processing. 3. The vertical frame is no fit for a horizontal format. Only a square American-style format or an uncommon vertical one will accommodate it. Moonlight exposures are especially good for showing movement, but here’s something quite literal: a minute hand blurred over a 60-second exposure, on the Lumix LX3. There’s actually a third hand (sometimes called a second hand) that you can’t see due to its constant movement. And the clock’s 12 minutes fast. The surf on the sheltered beach at Puponga (Golden Bay, Nelson) is really minimalist, so the lapping of the tide is just a subtle blur. 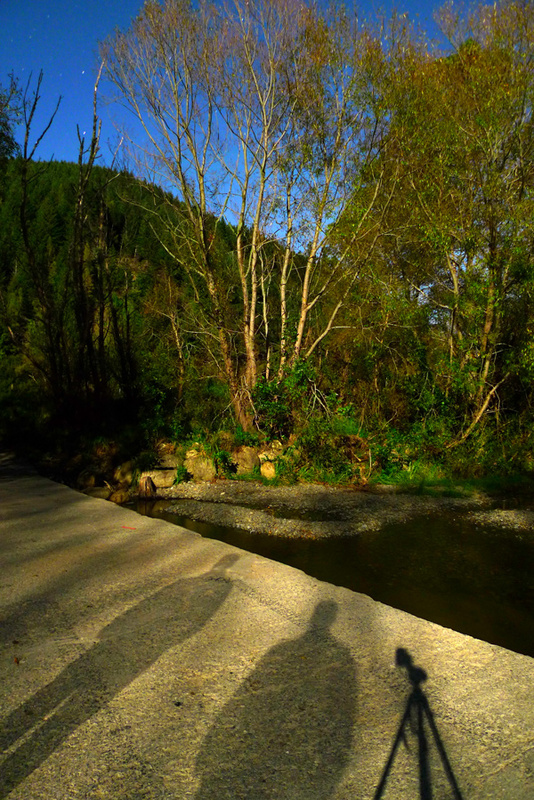 However it works in well with my shadow to give some added depth. The clock is perched on a big burnt log. 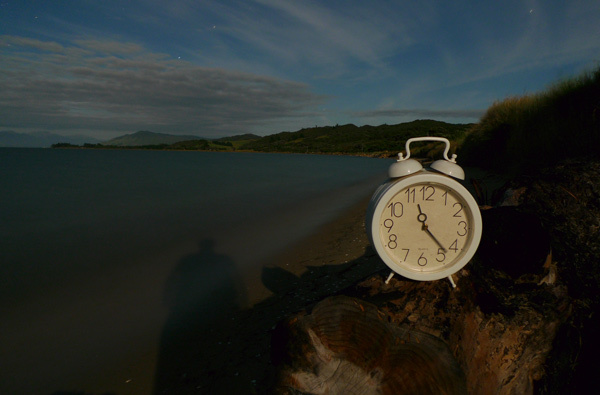 Not everyone takes a big clock with them on holiday, and not everyone likes their photos spiked with incongruent objects, but to me it’s all about the picture-making. After all, an element of surprise often features in a striking or original photograph. Although some colour is visible this scene is closer to how we see by moonlight; in conventional terms however the shot is underexposed, and only right for the highlights. So this required a slight boost in post-processing. My standard starting point for a high, bright full moon is f2 at 60 seconds, 100 ISO, or 1.66 stops more than f3.5 at 100 ISO for the above. Given the low, feeble moon behind me in the pic above, I’m puzzled the shot has come out at all. Also notable is the excellent depth of focus. Sure, the lens was at widest zoom (“24mm”), and the small size of the LX3 sensor helps too. The Lumix uses an infra red beam-assist for low light focus, which although spot-on here is often unreliable. 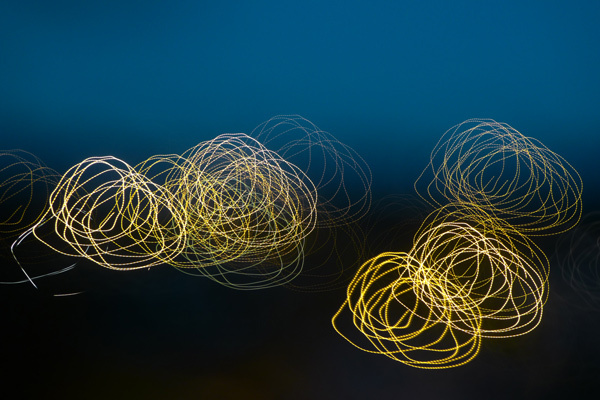 Mis-focuses occur roughly 20% of the time and are frustrating because they take up camera time – typically, 2 minutes each: one minute to expose, one minute for dark frame post-pro. The Nikon D7oo I am now using has a similar mode; however for moonlight photography it seems to do no better. Solution: the manual focus option. German Hill (395 m) is quite prominent on the north Taranaki ring plain; the only evening I’ve been to the top the wind chill was so ferocious we stayed only a few minutes. This night, though, I was hanging around solo on Maude Road, waiting for an after-full moonrise. The sun had set more than an hour before, so the light above is all lunar, as this equation makes clear: f2 at ISO 400 for 60 seconds, on maximum wide. This setting is right at the edge of the Lumix LX3 capability. There’s an unexpected blue between the moving bands of cloud, and the sweet look of dawn. The highlights are totally blown, admittedly, but without a graduated neutral density filter or any fondness for high dynamic range (HDR) the choice was simple: either get the sky right or the landscape below. Moonlight photography in winter has one big advantage over other seasons: night comes earlier, moon rises sooner. The same celestial mechanics also favour camerawork on the evenings after full, when the waning moon rises roughly an hour later each night. Let’s take the winter moonrises of July 2011 as an example, say from 40 degrees south (175 deg east). The full moon rises at 5.14, exactly at sunset (usually it’s only close) and on following nights it rises at 6.19, 7.22 and then 8.24pm. Even when we allow another hour or two for the moon to gain some elevation for a brighter light, these times are not too yawny for most people to venture out. But in summer? This (southern) December the full moon rises at 8.44pm, 4 minutes before sunset, and on the wane it shows at 9.43pm, 10.16pm and 10.53pm. As the summer moon also arcs low, it takes longer to give a good light. 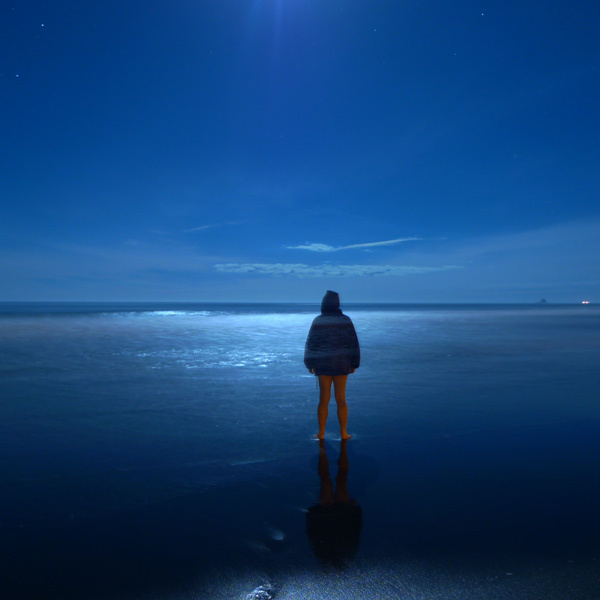 Few people find the midnight hours especially creative, particularly outdoors. The secret on these evenings? Get out earlier and play around with starlight or city glow, while you wait for the magic moment. Stars are suppressed by moonlight because they are competing with a brighter sky. 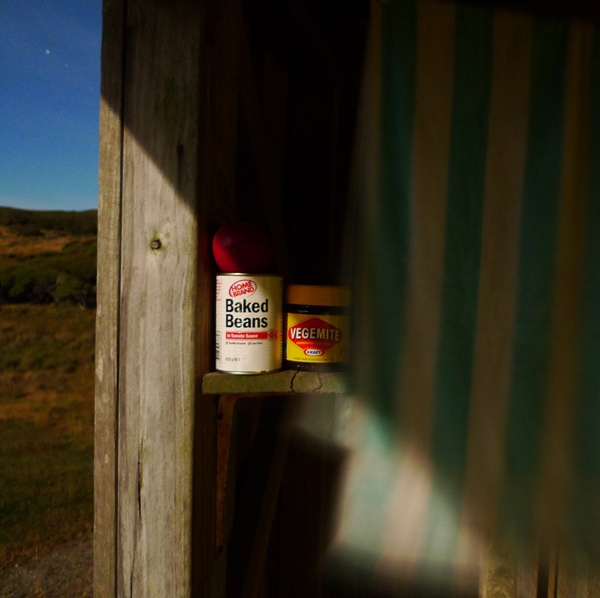 Nevertheless, while out with friend Richard one clear night at the base of Farewell Spit, I dedicated roughly 15 minutes to placing the lone manuka against a moonlit sky. 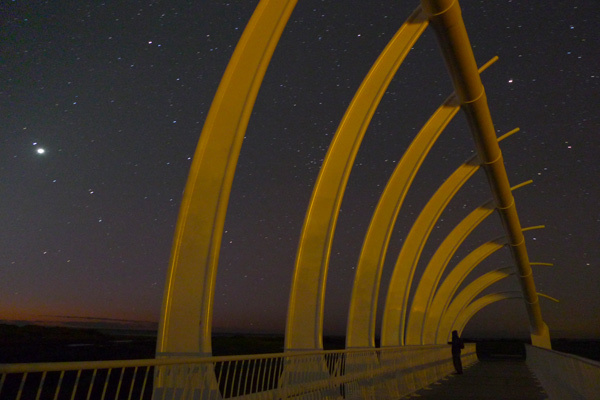 The starry arc is identical to that seen in 46. Bullock Creek – meaning we’re again looking east, this time towards the northernmost Albel Tasman National Park. 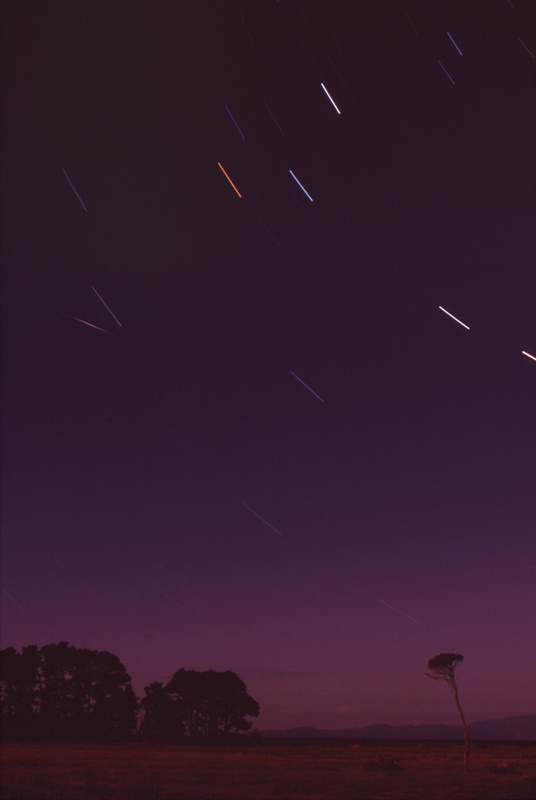 People are always surprised by the variation in star colours, while the meteorite flash was unnoticed at the time. The glow across the bay I can’t explain, but there’s a general shift to warm colour here, made clear by the “normal” colours that Richard got at the same time on his digital Canon. It’s an innate tendency of all film to “go off” on the B setting; Fujichrome is usually less susceptible than Kodak, but not here. However I find the effect quite moody and acceptable. A note in my camera bag recommends (with the 85mm lens) 10 minutes at f16 for star trails, at ISO 200. For film f11 might be better, as it slows up with long exposure. A standard lens was used for this picture but a longer lens often gives better results, as focussing is not so fussy at these smaller apertures. After 5 to 10 minutes film has a real advantage over digital – especially if, like my old Pentax, your film camera operates without a battery (light metering excepted). Extended exposures are a serious strain on digital battery power. Also, once the exposure is done there is no dark-frame waiting around either, the post-processing noise-reduction interval usual in digital cameras. The 24×36 frame here looks too long and narrow to me. So often this is a hard proportion to use well in vertical compositions; they only really work with good vertical lines. The Lumix LX3 has three format options, including the TV screen 4:3. I’d love cameras to have square and oval options too! 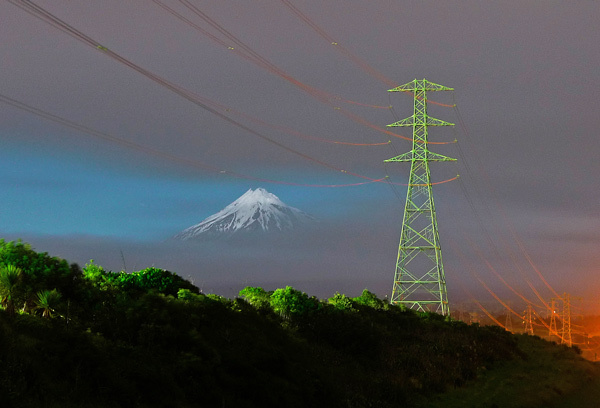 Actually the foreground is lit by the petro installation on Centennial Drive, New Plymouth, but the fast-approaching squall is by moonlight. My car had to be parked next to my set-up for shelter from the strong wind. The squall came in rapidly and soon hit, so the next shot was abandoned halfway. I discovered that clambering into your vehicle in pelting rain with a long tripod and open-shutter camera is harder than you’d think. The artificial lighting at this distance balances with the clouds, whose brightness required slightly shorter exposure than the usual Lumix LX3 scenes: 40 seconds at f2, ISO 200. In this wide angle view, movement in the squall cloud is less than expected, although it is only about 600 m away. The well-defined cloud beyond must be heading straight for the camera, as well as being much further out, as 40 seconds is long enough to blur similar clouds if they are closer, or moving across your view. As the squall had tone rather than colour, and as the foreground colour didn’t add much, I switched to black & white in camera. The moody tint was added later in post-processing, under Colour variations (convert to colour in Mode first). The simple, layered composition gives a sense of depth and works well for me, but would be less effective if the fence battens were unangled. The advantage of the square format for the photographer is that neither horizontal (usually) nor vertical lines are immediately favoured as elements in the composition, meaning that all lines on offer to the creative eye compete on equal terms! However, to be sure that I do not fall captive to the lure of the square format, this image completes the current series. 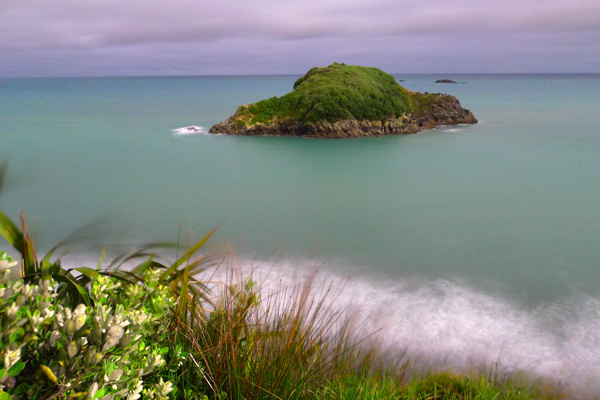 The coast here is now protected as the Tapuae Marine Reserve, a development which contrasts strongly with my boyhood memory of a suspiciously smelly outfall in this neighbourhood – on Paritutu beach below the chemical works. 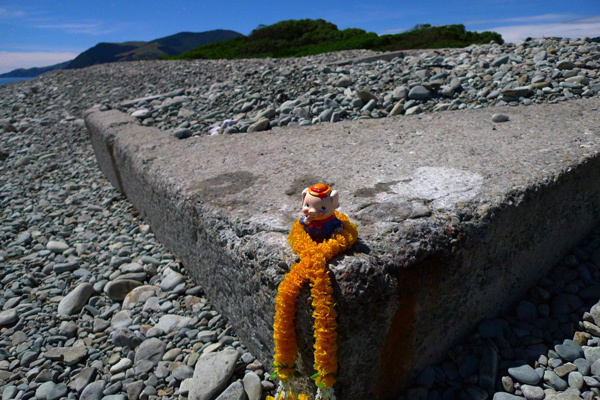 Te Hapu is a scenic cattle station in the South Island, on the West Coast at Golden Bay. 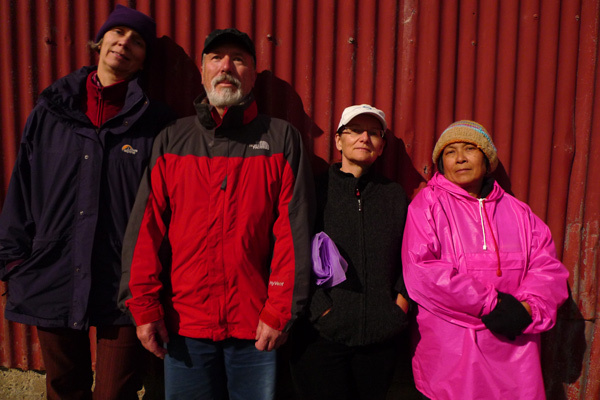 Last year we had a few days at full moon there, staying in a refurbished woolshed. It’s a fabulous coast and if I publicise it here no matter, as the gate is locked and only guests have access to the property, which includes Gilbert’s Beach. This cameo is taken on the woolshed porch, where a towel was flapping in the steady breeze, despite the sheltered position. The wind was too strong for any outdoor moonlight photography, as I had soon discovered when a gust blew my gear over, denting the Pentax. From the lee of the porch I then wrote another page in the Book of Hazards by thoughtlessly moving around while my minute exposures were in progress… from the creaking floorboards the vibrations went straight up the tripod to the camera. Fortunately I had learnt to keep still by the time I took this, a wide angle shot (24mm equivalent), wide open at f2, at ISO 200 on the Lumix LX3. The product placement from the pantry is more central than intended but I believe the strong diagonal of the shadow compensates in this revised crop from the usual original. The line is completed with the blurry star, showing the limitations of f2 for depth of field, even at the widest angle the LX3 provides. I’m experimenting with square format because it generally fits the printed page better than the 2:3 of the classic 35mm frame. It’s also more of a challenge, and recalls my camera of yore, the Yashicamat 124G, an old-school twin lens reflex. With a TLR camera the rigour of the square frame is increased by the image always being reversed in the viewing glass. Not so in a modern digital, but the LX3 viewfinder is useless in such low light, making the camera a true point-and-shoot. We took Perky Pig, a retro coin-jar, and a plastic garland out to the Boulder Bank, Nelson, to add colour to the textured landscape. 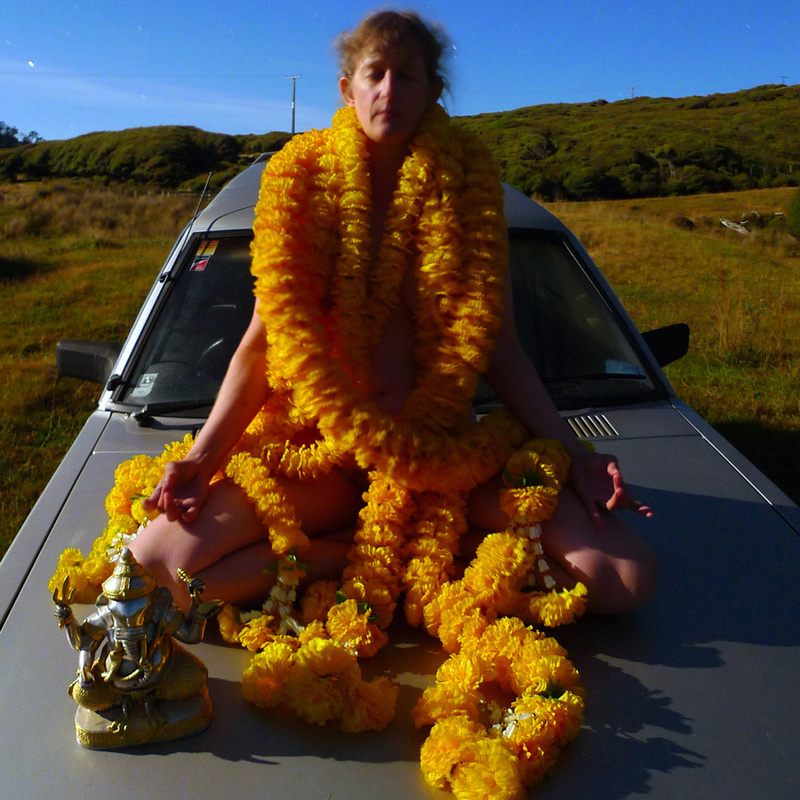 Perky’s from an op shop but the garland comes from Bangkok, where they are much used. The orange highlight and strong lines of the concrete groyne are offset by the background scrub merging with the heights of prominent Drumduan, backing the coastal enclave of The Glen. Our scene was just below the occasional passing headlight, but unfortunately not beyond the pall of the sewage works nearby. 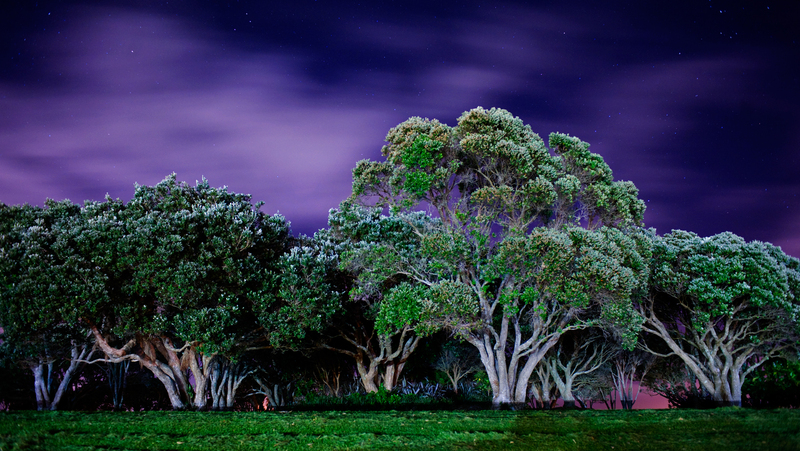 The exposure was 60 seconds at maximum aperture: f2, ISO 200, with the zoom at its widest. The daylight effect is pronounced, but without visible star trails and obvious cloud movement nothing suggests actual moonlight, as even the distant lights of The Glen are hidden by the low viewpoint. I forgot movement! OK so the maths isn’t important, but it helps make sense of how f-stops line up: f1.4, 2, 2.8, 4, 5.6, 8, 11 (ah – should be 11.2! ), 16, 22, 32, 45, 64, 90 etc. And those are just the full stops. It’s uncommon to find anything past f22 on a modern barrel, but on the view camera that was fairly fast for Ansel Adams. A zoom has to extend the lens to change the focal length, so it makes the ratio at the far end smaller – on the Lumix, f2.8. A single stop isn’t much except with longer lenses, if your camera is already at the edge of its light capabilities. Then it can make a big difference. 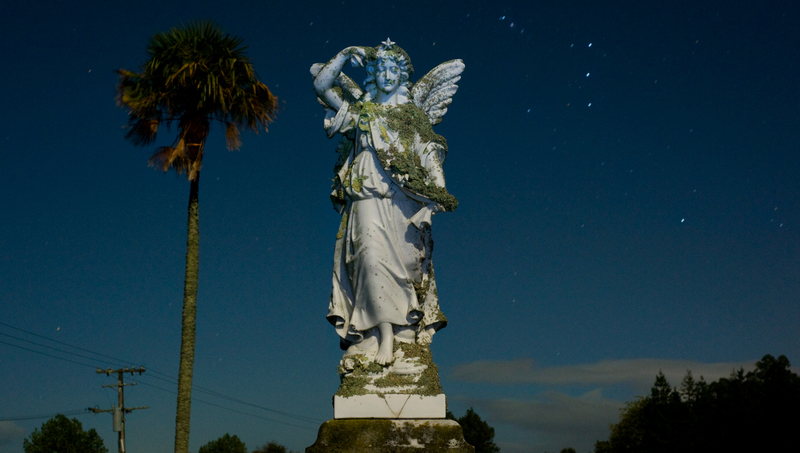 What’s a little unusual about this scene – not the long exposure (60 secs at f2, ISO 200), the moonlight or the cherub (supplied of course by the photographer) – is the vertical composition. The spire and the height of the trees make the usual horizontal composition here fairly difficult, but they are well adapted to a vertical composition, as seen here in wide angle (24mm in 35mm film terms). Strong vertical elements are usually required for the success of vertical compositions, and this has at least three of them. A good depth of focus is the main challenge in this type of set-up. For f2, the depth of focus is quite amazing, softening only on the immediate foreground. As the Lumix LX3 was already at its longest shutter speed, the only other way to extend depth of focus was to select a higher ISO (to give f2.8 at ISO 400; f4 at ISP 800, etc), but higher ISOs are marginal with the LX3 – another limiting factor. At least the newest models have much improved ISO capabilities. 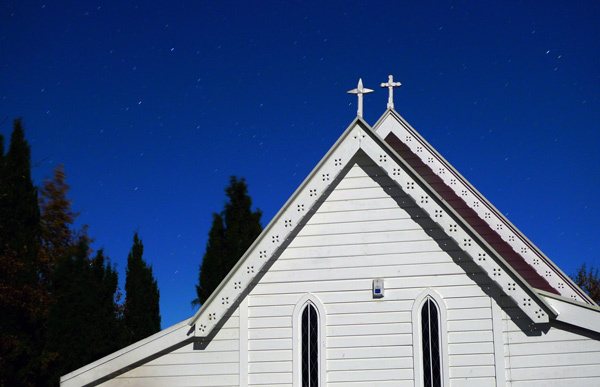 There is good colour range in this image and some strong horizontal lines (wires, shadow, church), while the stars and moving cloud in a blue sky complete the picture. A minor challenge was to finish the exposure without car headlights striping the scene, as we were on a country road with reasonable traffic for early evening. A distant headlight to the left of the fencepost adds more “night proof”. The little angel comes from Bangkok; she has fairy wings of course so scarcely fits the usual Western conception, however her status is clear from her origins – a Catholic supplies shop (for Thai, not Westerners) – and her purpose, which is to adorn a household shrine. I attempted some torch highlights on her in the same place, but was still trying to get the lighting to balance when it clouded over. Sadly at that point the evening’s photography came to an end. The rugged Nelson hinterland has many forest plantations to supply this “dark satanic mill”, sited on a reclaimed shore of Waimea Inlet, not far from the town of Richmond. 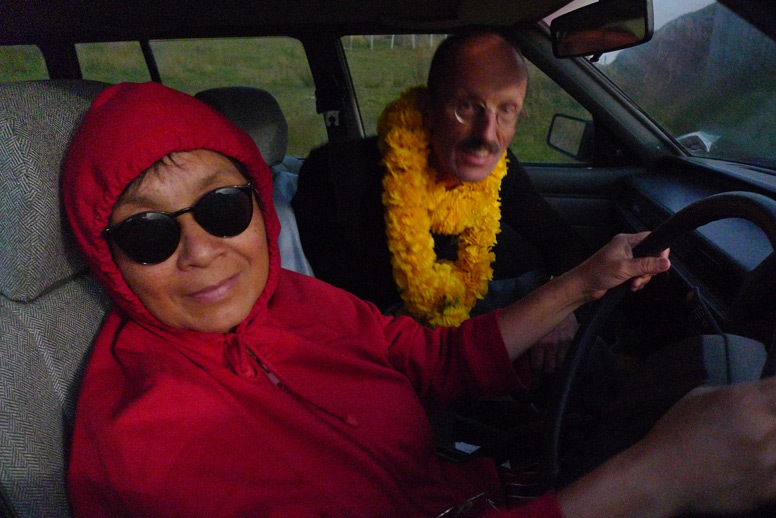 My approach was at sunset, across the mudflats of Tasman Bay and along an uninspiring shoreline, access which I had reconnoitred the month before. 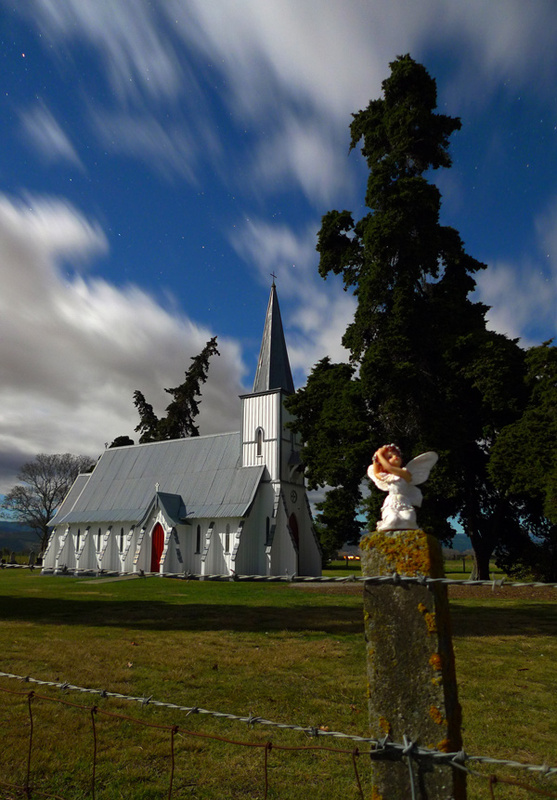 This time I came back with tripod and gumboots, and had an hour or so to fill before the moon rose, and other things. The tide was still far off, so I had only the baritone rumble of the mill for audio. 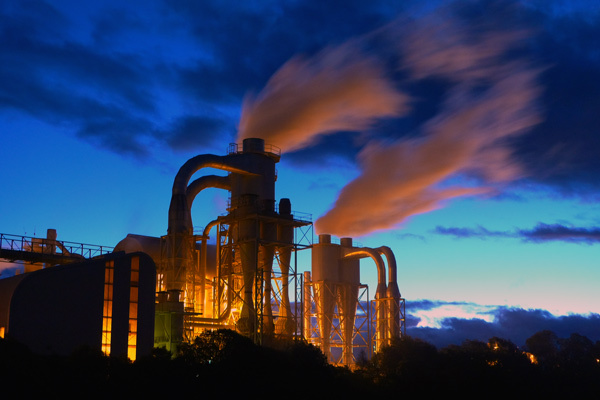 Industrial photographers pair twilight and artificial lighting because when faced with such tubercular monstrosities as this, it’s really the only lipstick you can apply. The twilight was much deeper than the sky suggests, but the lighting balance is about right and the shutter speed of one second has allowed a sense of movement in the vapour clouds (f2.8, ISO 400). Usually I select tungsten as the colour temperature, to deal with the orange cast of artificial lighting and to add more saturation to the blue background. Oddly, however, the daylight setting delivered more verve and drama for this one, so that’s what you see above. Colour temperature is measured in degrees Kelvin, and in photographic terms it ranges from roughly 1,750 for candlelight to over 12,000 for blue sky, with moonlight (4100) and bright summer sunlight (5400) in between. Tungsten refers to filament lighting and is fixed at 3200 deg K for photographers. Using the tungsten setting for daylight pictures makes for very sombre, bluish hues; with professional lighting however it delivers a full range of colours. Mixing daylight with pro lighting on tungsten film is an old professional’s “trick”. Advanced digital cameras have auto adjustments for colour temperature (white balance); this probably makes it harder for digital photographers to relate to the limitations of colour film, with its lack of flexibility with different light sources. Here is another moonless image (see no. 24), lit only by inner city ambience. While waiting for the moon to rise I did a patrol of our neighbours’ property, as they were on holiday. It’s a big place we once co-owned (many years ago, before we moved over the fence), yet passing the old shed I saw its possibilities for night photography for the first time. Although north-facing, its location meant it would not be moonlit for many hours, so after assessing the considerable illumination from city lights, I thought to make a start here. Exposure was f2.1 for 20 seconds on ISO 100, with the zoom on the Lumix LX3 set at 26mm (in 35mm photo terms). The clean colour on the figurine suggests a tungsten setting, although this is not recorded on the exposure metadata. 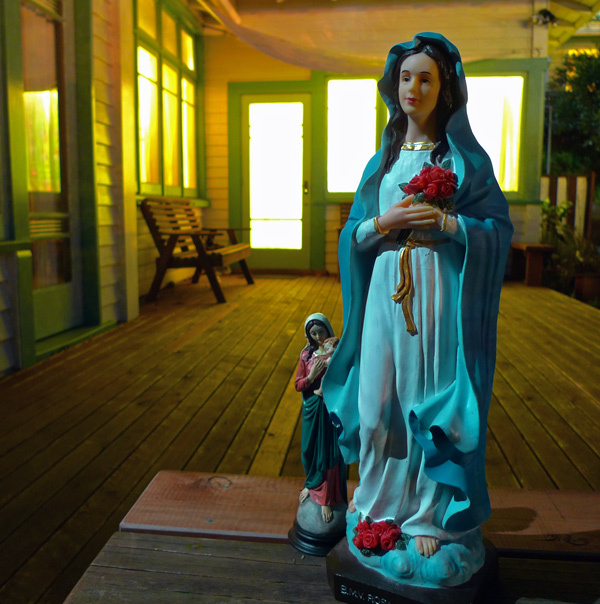 Aided by a good light in the shed, I placed St Mary on a table next to a nest of old bicycles. The exposure indicates that the city lights (as seen in the window) were still three or four times stronger than moonlight – so waiting long hours for some direct rays would have been pointless anyway. Actually, in my old neighbourhood the proximity of street lighting on three sides restricted my moonlit home-and-garden photography to only a few shaded corners. The blue sky on the right hand corner is explained by the moon having risen (but behind the house). The sky adds depth, while I like the texture of the corrugated iron and the prevailing colours of light blue and rusty red. The wisteria is bare in winter but beautiful in late spring. The Holy Mother is holding a bunch of roses. As I recollect she is about 40 cm high. We bought her in Bangkok, of all places, in a Catholic supplies shop. The Thais are very big on this sort of representation, be the figures divine, royal or simply revered: Buddhist, Hindu, Christian or folk. On a clear, crisp autumn night I had several hours of uninterrupted camerawork below the old Brook Reservoir, where a rocky stream under open sky presents many possibilities for long exposures in a peaceful setting. Only five minutes’ drive from the suburbs of Nelson, at the far end of the motor camp, this public reserve is unfrequented at night. 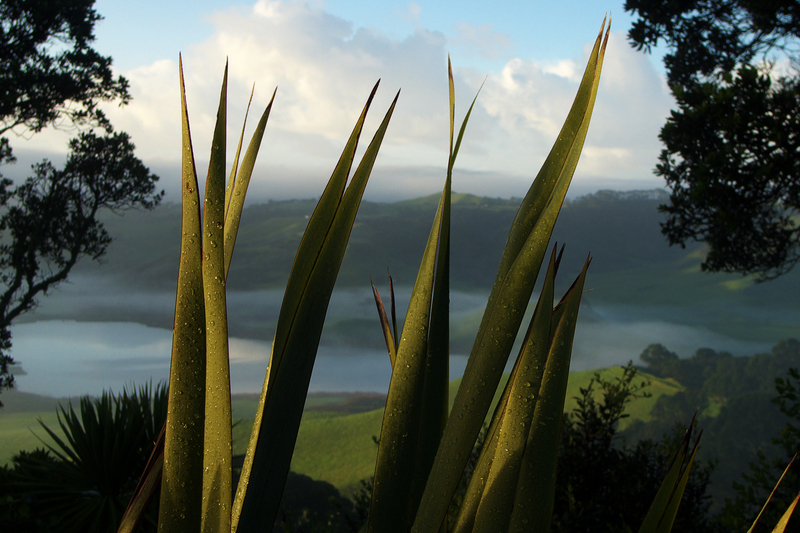 It will soon be part of the Waimarama Sanctuary, a fully enclosed wildlife and native plant reserve. 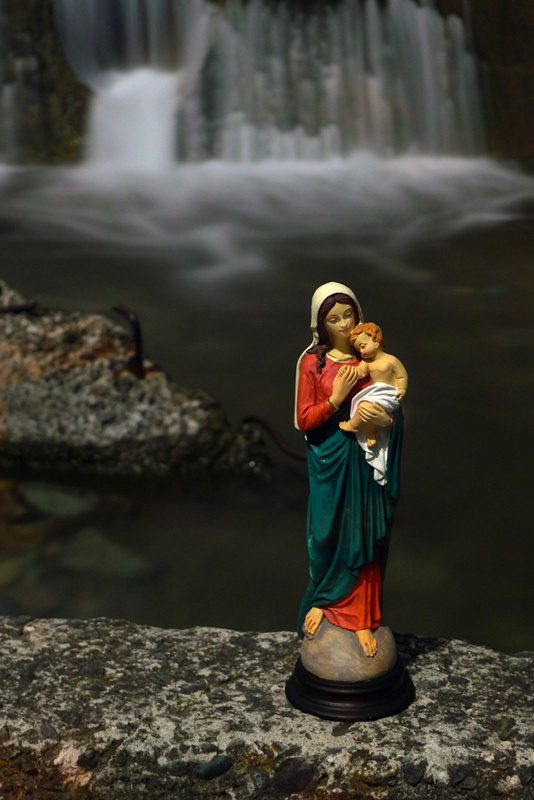 For this photo the Holy Virgin & Infant figurine was respectfully placed at the mouth of a culvert which diverts a hillside stream close to the concrete abutments of the reservoir. Apart from a surreal setting, the essential ingredients for this shot were a solid footing on the banks to enable a suitable viewpoint (doubtful at first), plus a vertical composition to take in both the figurine and the soft flow of water. Framing problems with the Lumix LX3 are evident in the close crop at the top, as the composition was a blind one, made by trial and error. Settings were f2.7 and 60 seconds, at ISO 400, the upper limit for useable images on the Lumix. Waterfalls and the like will convert to an attractive softness in only a second or so, but any exposure longer than 10 seconds ensures maximum effect. Unfortunately the exposure above was the longest the situation would allow, meaning some underexposure of the figurine. This was happily remedied later in Photoshop and dodging has brought out her colours. These make an agreeable contrast with the shiny greens and misty appearance of the water. Scale is not obvious but the figurine is about 25 cm high. 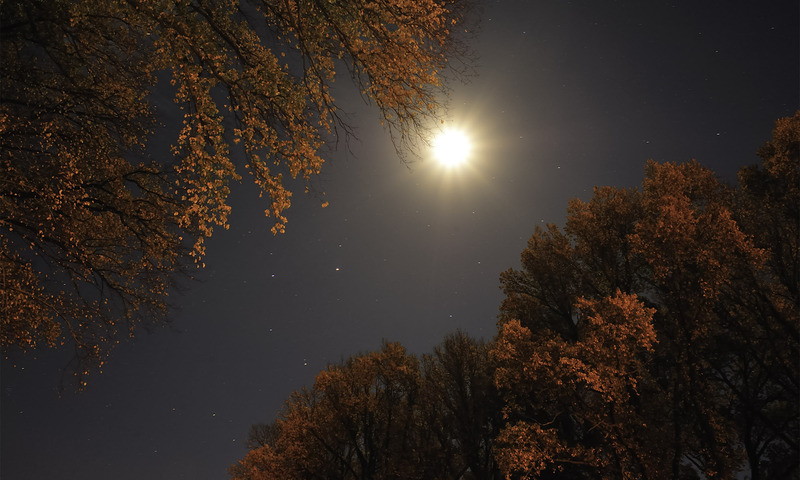 Although some extra care is required in the focussing, close range images can make for striking and original examples of moonlight photography. Alas, how different my white stallion looked the following night when he came down to the fence; on this second stop we saw instead a small and somewhat scrawny pony – one of a number, it turned out. In a metaphorical mood, I remarked to Gerry that moonlight is to ponies what candlelight is to people. Where moonlight draws a veil, daylight reveals all. 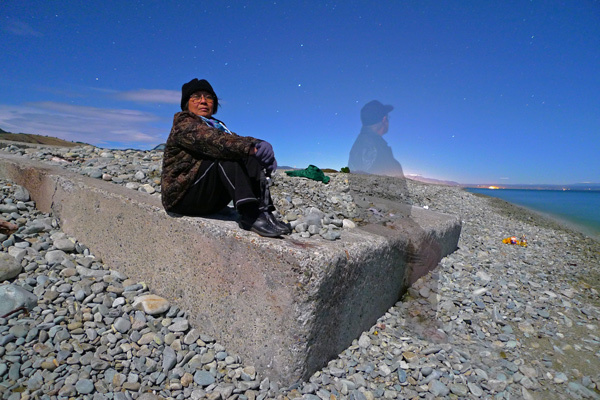 Such surprises showed up in other photos from that night – an unseen curve of tarseal here, an erosion feature there – but these are only minor bugbears for moonlight photography; a bigger issue is just getting the frame properly focussed. Of my numerous shots here, only this one is halfway sharp. To minimise likely movement of the pony I used a large aperture (f2.8) for 5 seconds at ISO 2000, when a better hedge would be to counteract the shallow focus of the 85mm lens with a smaller f-stop (to deepen the field). Results with the manual setting were no better. 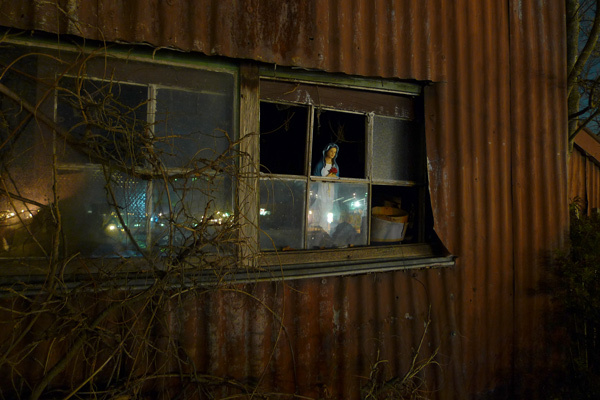 The 85mm is a great lens by daylight, but I need more care and experience with it by night. This was only my second evening out with the new Nikon D700; after the frustrations of the Lumix LX3 it felt much more productive to be using shorter exposures enabled by higher ISOs, a faster prime lens (f1.4) and a viewfinder easy to compose through. This image is one I was thrilled to get. It’s taken from an elevated platform some way up the steep steps from Back Beach to the carpark. The location is Paritutu, a volcanic relic of old New Zealand and a favourite haunt of mine; the giant rock somewhat shields this viewpoint from industrial intrusion. 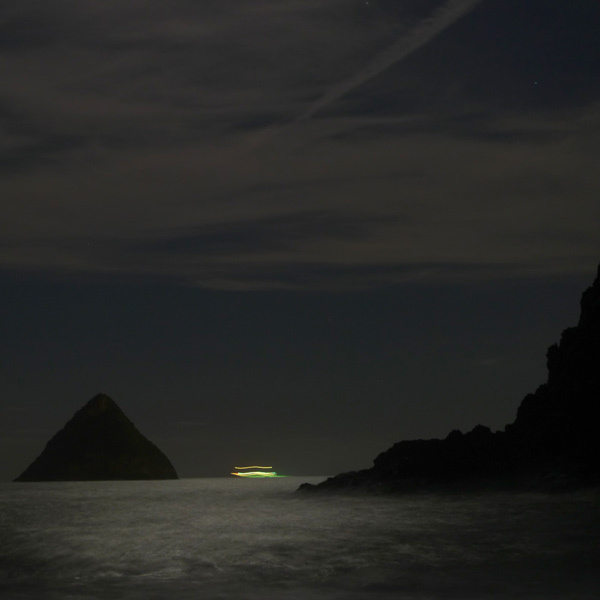 Offshore is distinctive Saddleback (Motumahanga), one of the Sugar Loaves (Ngamotu) – and the light trail of a departing ship. Just around the corner to the right is the harbour, a decommissioned power plant (and 195 m chimney) and fuel depots. Exposure was 1 minute at f2.8, ISO 100, lens at maximum setting (60mm in 35mm terms). 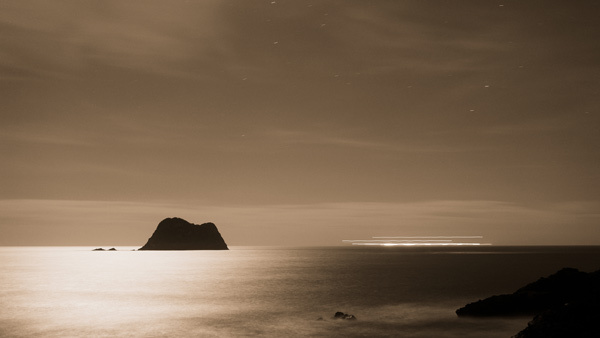 The moon was 4 nights away from full, so far from maximum strength, but seascapes using reflection and silhouette require the least exposure of moonlit subjects. This could be one reason for their relative commonness, although I believe the light trail rescues this example. There is nice detail in the foreground rocks, the surf is wispy, the clouds have come out well… taken in monochrome, with a sepia tint added later. My earlier, colour versions of shipping movements from the beach were disappointing for the lack of a good telephoto, which I will re-visit and remedy sometime soon. The elevation here adds a sense of depth unobtainable on the beach. As a sheltered corner of the coast the steps were very welcome after four exciting but tiring hours on the wind-swept beach. Not a soul had come by in that time – I had the place to myself the entire evening. The 6×7 Pentax had unfortunately packed up at the last frame on the beach, leaving me just the Lumix LX3 to play around with. One minute exposures are followed by a dark frame minute before your image appears – meaning you have plenty of time to enjoy the silence of the stars, to the soundtrack of the surf. After midnight, with increasing cloud, the moon shining all too briefly between great gloomy scuds. 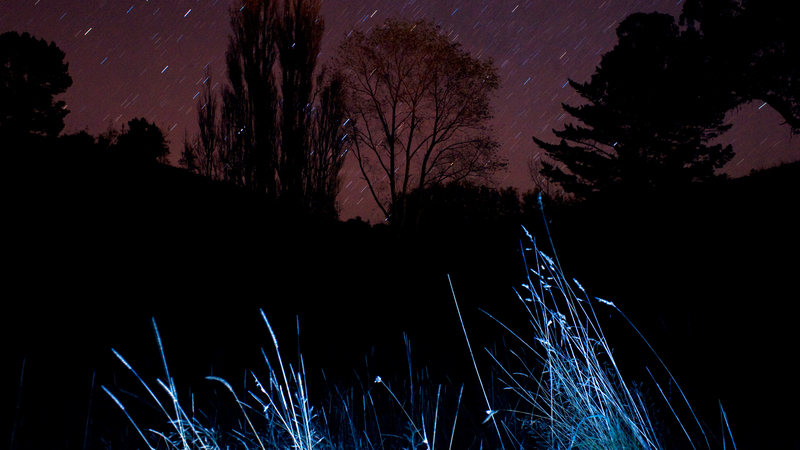 f2.8, 60 seconds, 400 ISO, slightly cropped to trim intrusive vegetation. One big drawback of the Lumix LX3 for night photography is that while the 60 second shutter enables, the viewfinder disables. Nothing can be seen because it’s too dark! So you have to aim by guesswork, adjust and re-shoot, adjust again and keep at it until you get it right. Trial shots at 3200 ISO make this process speedier, with exposures of 2 – 8 seconds, but another hassle shows up meantime: the zoom auto-retracts. So if you favour the standard end, you must also remember to check the zoom each time, to be sure you still have the same angle of view. The high ISO trial images are not actually useable because the Lumix is marginal even at 400 ISO, while pics at 800 ISO are virtually useless. I was a bit shocked to read on a high tech website, www.dxomark.com, that the tested limit for good ISO images for the LX3 was just under 100 ISO! While photography is all about such problems, and how to overcome them, my immediate challenge (above) was to nail the peak as it came into view, as the swirling cloud repeatedly obscured it. It was good to have the swirl in a supporting role of course. The sheltered tree ferns suggest only calm and it was a mild night, thanks to the northwest breeze, but the mountain seemed very close. The top of Kent Road is not far (5km?) from the National Park boundary. This appears as JULY in my Taranaki the Mountain, by day & night 2011 calendar – but can it really be Taranaki without a sprinkling of cows in the paddock? 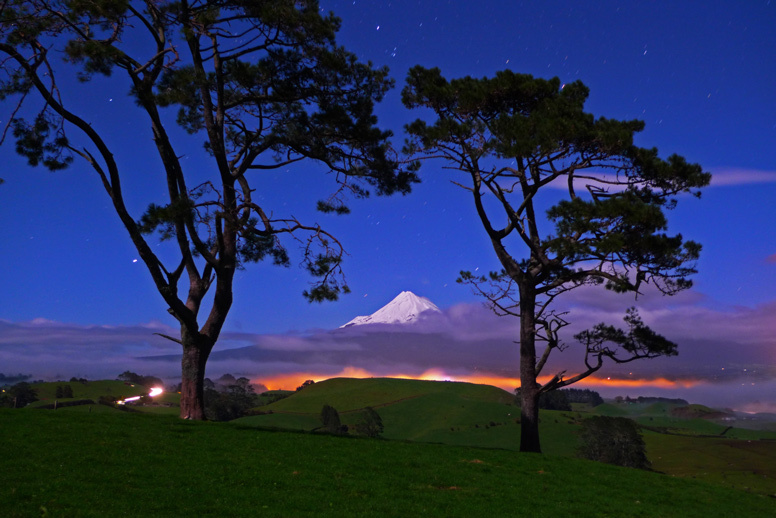 The last shot possible that evening, as low cloud rolled in to obscure Mt Taranaki and the moon itself. Exposed to the prevailing westerlies, this region has highly changeable weather and many a moonlit evening is lost to incoming cloud and rain… Actually I should have nailed this view earlier that night, but I spent too long looking the other way, out to sea and out of sight of this. 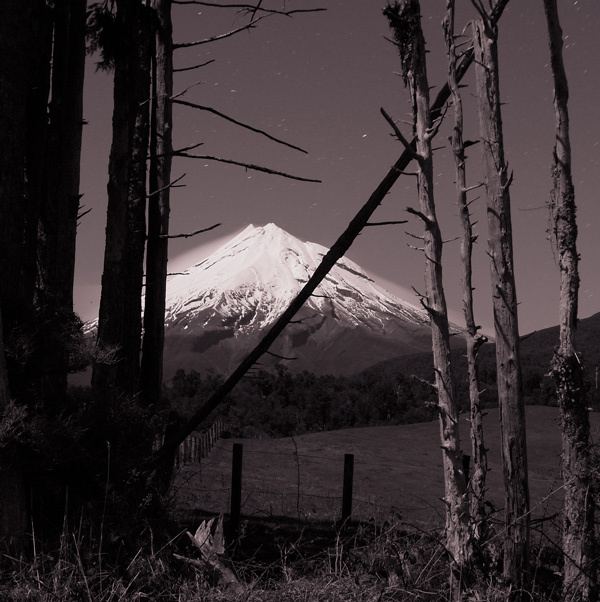 It’s taken at f2.8 for 60 seconds, at 200 ISO, and shines as the MAY pic in my Taranaki: the Mountain, by day and night calendar for 2011. This is unusual firstly for the peek-a-boo moonlit mountain; secondly the even balance of lighting on both peak and pylons; thirdly it’s a major crop from a Lumix LX3, a desperate manoeuvre when a standard lens just won’t pull the scene in. The balance of light values is luck rather than design, helped by the snow still around in late spring. 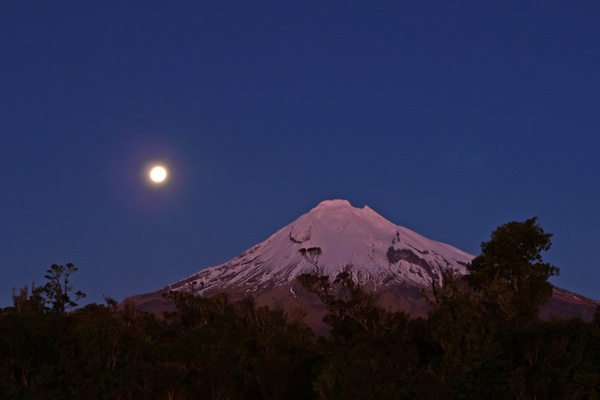 Taranaki is an awesome sight by full moon, but it’s visibility depends on the reflective power of a good snow cover. Over late summer and autumn, when it is bare, the moonlit peak is less conspicuous and sometimes I have to do trial exposures from home to see if it’s really mountain or just cloud on the southern horizon. Paritutu strictly refers to a volcanic outcrop behind the port, some 153 m high (500 ft), but this shot is taken nearby, at road level. The floodlight from the left is from the Dow chemical plant, the sodium glare on the right from the tank farm. The march of pylons comes from a decommissioned power plant at the port. All in all, quite an industrial setting for Paritutu Centennial Park, yet the park came first (1940). 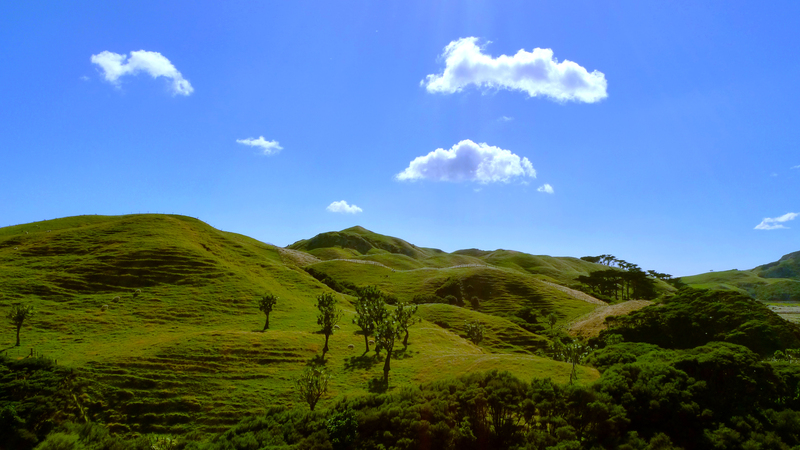 It includes the Sugar Loaves, volcanic remnants quite distinctive to our coast, which north of Kapiti is otherwise entirely island-free . FEBRUARY in my Moonlight Calendar for 2011 – a simple scene that seems to intrigue people, a minute of miniature surf on the cobbles of the Boulder Bank. The Bank is a unique natural formation 18 km long sheltering Nelson Haven, Port Nelson and the city. 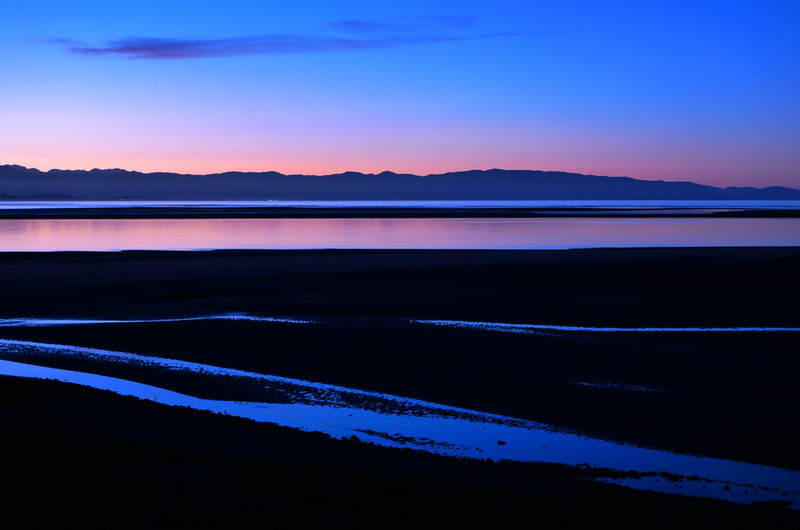 Here, some 10 km along it, we’re looking across Tasman Bay to the hills of Abel Tasman National Park and Separation Point. It was a still evening, common enough for the Bay this time of year, and while I knew the wave lap on rocks would look good, I expected a more visible streak of surf than the sea-mist which turned up instead. True the surf was small, but it was perfectly formed and enough to wet your gear if your tripod was too close to the action. Quite apart from the uneven footing, finding a suitable spot in the tide for the tripod was a challenge, as further away from the surf there would be less impact. There’s a lot to be said too for knowing the tides, but this evening I’d forgotten the tables. Since then I’ve bought two of them – one for the car, one for home – as they contain daily sun and moon times also, always good to have on hand. Although the Lumix LX3 zoom is restricted by a lack of telephoto, the standard setting has good depth of field, as this frame demonstrates at f2.8 and 200 ISO. My new 85mm Nikon lens might have handled it better, but a longer exposure on f16 and higher ISO would be needed to get close to the same depth of field. This would mean more cloud movement too, which is sometimes good but here I wanted the distant cloud as it looked, even if some drift is detectable. This shot could have been a good monochrome, but that has only come to me more recently. Late sailing through the Cut, Nelson. 11.06pm, 11 April 2009. The JUNE image from my Moonlight calendar for 2011. Note the blue of the sea and background, the white boat light and clean sodium fill on the shrubs in the foreground… all signs of a tungsten setting. Tungsten refers to filament lighting, so this answers the orange cast of most street and home lighting. Tungsten also adds a coolness to moonlight which is in tune with our actual perceptions, although moonlight is basically golden sunlight – reflected sunshine that hits us less than 2 seconds after bouncing off the moon. The moon’s warmth changes with its elevation in the sky, the same as with sunlight. Moonlight warms conspicuously when the moon is closer to the horizon, when its angle of strike through the atmosphere is more oblique. The Cut is a passage dredged 100 years ago in the Boulder Bank, an impressive natural breakwater. Port Nelson is nearby and other, bigger boats came through the Cut that evening, but none described an arc as simple as this fishing boat’s, in a minute exposure at f2.8 and 200 ISO. Two minutes would give a better effect but longer exposures aren’t possible on the Lumix LX3; while it has a generous 60 second setting (hard to find on more sophisticated cameras), there is no B setting, for time exposure. I checked my file sequence to confirm the boat was going out, not coming in. 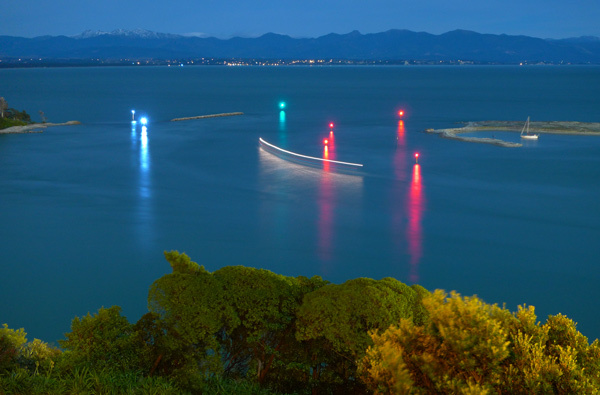 Tasman Bay is quite sheltered and the lack of swell is evident in the even curve of the light (no squiggles), although there’s minor movement of the distant yacht on the high tide. Other movement is visible from the breeze in the greenery, but not the flashing of the harbour lights. Background lights are those of Mapua. Some foreground was unavoidable from the only vantage point available on the cliff above, but I believe it adds some sense of depth all the same. 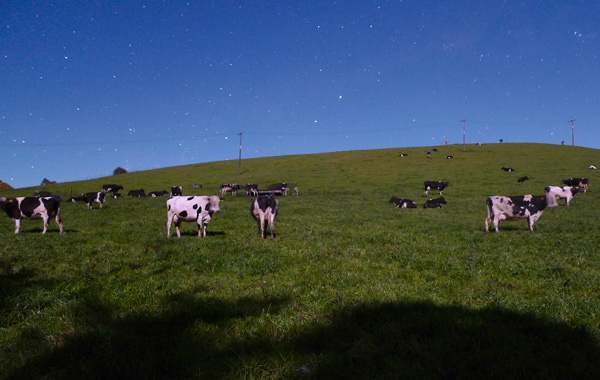 Farm animals make good subjects for moonlight photography precisely because they won’t keep still. Sometimes they hold it remarkably well though, as this placid minute in a cow paddock shows. The two leading beasts twitched their heads, to prove the point that this is indeed a night photo – as if the stars weren’t evidence enough. With the lens at widest zoom and f2, ISO 200 was the setting. The wide perspective has reduced the star stutter; conversely for maximum star trail effects, a telephoto is more appropriate. Unfortunately, for star effects one minute is neither dot nor trail, but some sort of middling dash. I chose the slope for its simple ridgeline and because the cows would be nicely placed along it. Often some elevation is needed to give a scene that extra sense of depth and here the rising ground served that purpose. The shadow of the trees behind was steadily dropping as the moon rose, but I wanted this in the frame to make a compositional third; the grass seemed a bit blank otherwise. The water trough was not visible at the time and shows too much in other frames. I liked seeing the stock uncrowded, strip-grazing being so common on Taranaki dairy farms. This photo comes without the incredible sound-track of cattle lowing, blowing, peeing and huffing; a sonic performance that as a townie I would never have imagined. 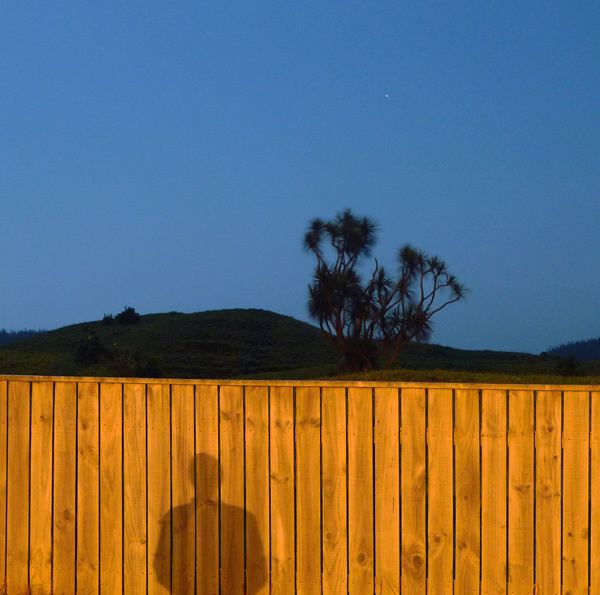 Featured as NOVEMBER in my Moonlight Calendar for 2011, this shot is taken at the fenceline of a no exit road. I’m not against getting closer but our spontaneous wander down it meant we did not have any landowner’s permission. Country people are suspicious enough of vehicles on their quiet roadsides; staying close to your car allows an immediate explanation. Whatever, a no exit road should reduce the chance of disturbance.